The borough should provide the trash containers then. Not everyone has money to continuously spend on trash cans that get destroyed. So how is this being communicated to the majority of residents? While I agree with controlling loose trash and rodents, a few weeks warning would be nice. Sounds like a "quick" revenue generater. I totally agree. Sounds like borough trying to make quick money. They have other quick tickets too ( like high grass)but fail to follow through with them when reported.Unless the trash company has issues. Should not matter as long as people dont have trash out in advance. Go with take away refuse. They will give you a 65 or 90 gallon toter and are cheaper then everyone else too. I think there is more important things that NEED A QUICK TICKET! now watch all the trash bucket be all over the street when its windy outside and then they crush or lost. its only take one person to tell the borough about it. Oh what happen about week ago when there was about 85 old cars from 1915 and under its seem like you take only what you want to take. Why don't you try doing your real job going after people's properties who are unfit like the bigler's but no let's get the good taxpayers and give them more burden. That's okay this town's going to be a ghost town soon because of the new possible 2.9 tax increase, none of us will be able to stay. the borough need to seed out notice to the resident to let them know before they ticket you. Mark you containers...I had one that missing last year that I did not mark. It went missing one morning after trash pick up. I saw a similar container in front of a residence around the corner the following week but I could not prove it was mine though I was very sure it was. Guess it was cheaper just to steal one then to go buy one. 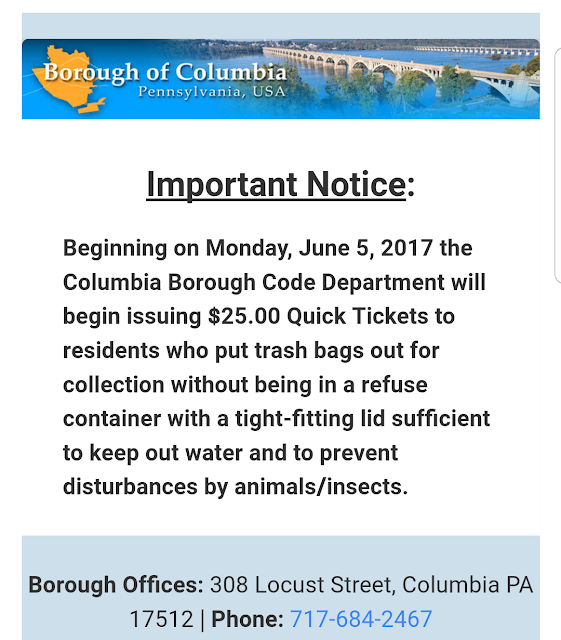 Even though, I am for placing trash into containers, I think the borough should do a better job of telling the residents. A few days notice is not enough if people have to get them. If our code department is going to do this, cite the high weeds also. Walking down the 400block of Locust St., I noticed a bunch. Also, cite the people that start placing trash out on the weekends, when their haulers pick up Tuesday. If they are going to do the job, do it right. The boro needs to send out letters in mail if they intend on doing this. Not everyone has internet. Plus like others mentioned there is alot of properties that need taken care of and lots of slum lords in town and nothing is done about it. Always picking on the people who take care of things rather than addressing the isssue to the ones who are causing the issues.No wonder people are moving out of Columbia. Columbia does everything in a half assed way , really a clas act!!! Nice job !!! First I agree there should have been more of a notice...like 2 weeks. Secondly, if you're not familiar with the new Codes Dept....it's not hard to see they are doing just that-condemning properties that have been eyesores for YEARS & requiring accountability! They do respond to complaints, issue quick tickets, etc. If you have a VALID complaint CALL into the office and report it. I have. Yes, I have called into the Boro Code office with complaints! I've been pleased with the responses I've received. It may take more than one quick ticket or longer than 2 weeks to correct the issue, but they are not afraid to issue a second quick ticket or address the issue in another way. And yes the issue gets corrected! Go to Borough Council meetings, they are the Management that directs Code officers. IF you see Boro Councillors on the street, at events, etc.talk to them, tell them your opinions, your observations. They serve for ALL constituents. They ALL have PUBLIC phone and or emails to reach out to them. Do it! Help assist them in their fight to clean up Columbia and demand accountability, responsibility and compliance especially with the rental properties that are a constant eyesore, problem for long term homeowners, etc. Glad they are cleaning up the town! I agree with someone else's comment-time to take back our town, encourage "Neighborhood Watches" again. Turn your porch lights on (use LED's they cost almost nothing). 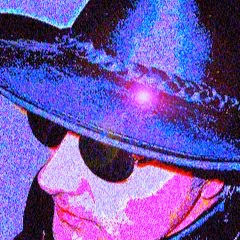 Lastly, help your elderly neighbors, your sick neighbors, your young Mothers,,,keep an eye on them, be the sunshine in their day!!! If we ALL step up to the plate and invest a little time and energy, maybe we can turn Columbia back into the booming river town of the glory days!! !When everyone knew their neighbors, no one was afraid to walk alone, the Police were very visible. I've had success with the codes department also. But I've also have had numerous acts of retaliation by the quilty offenders. I refuse to give up though, unless there is no new tax reform in the boro. What is going to happen when everyone that received a quick ticket wins a class action lawsuit for not following due process? This method is currently being challenged in County court. The attorney's that are handling this will be submitting a rtk request for everyone that received a quick ticket for monetary judgement. I totally agree that purchasing trash cans is not cheap especially for some families in Columbia. I also understand why the officials want trash in containers. The borough provided the recycle cans, so if they want to make this new regulation and plan to vigorously enforce it they need to help provide trash cans to families that express a need. I was explaining this new regulation to my grandson and he said, "There's more laws in this town than a prison, I'm glad I don't live here." What happens when you already have two trash cans and maybe you have a couple extra bags of trash that that won't fit? Do you have to go buy a third can? My trash collector allows us 3 extra trash bags plus my container. Who is going to be responsible for buying my extra can and who is going to put it around back so it doesn't blow into the street since I work for a living? Where can I quick ticket the borough for irresponsibility? Aren't you obligated to let us know about these changes in a better format? What happened to the Court challenge to this?